Have you noticed how visual a medium the web has become recently? In some ways this is a continuation of a long term trend. I remember when the internet was all text, with the occasional picture that took forever to download. Since then, it has steadily become more visual. The web then and now is like comparing an academic monograph to a highly illustrated coffee table book. Which would you rather read? There are two reasons for this: improvements in technology, and diminishing attention spans. Super-fast wireless broadband means pictures download instantly, and video streams effortlessly for many people. Technological developments have made photo sharing and video sharing sites possible – and popular. The other reason is our shrinking attention spans which, online, are tiny. This is understandable – there is just so much online information to wade through these days, who has time to read lengthy paragraphs of text? We want succinct blog posts, short videos, and pictures. Something that will show us at a glance if we’ve found what we’re looking for. Something that will attract our attention and draw us in. Something that looks nice that we want to click on and share. This is one reason why Pinterest is such a success. 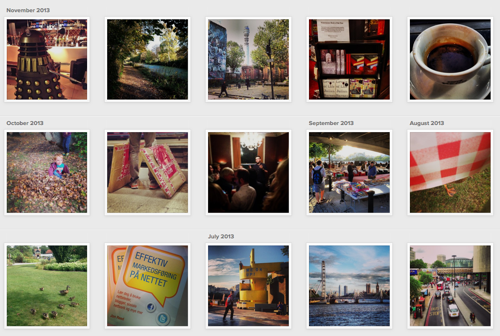 As an online scrapbook of images it is attractive – even addictive. As a social bookmarking site, it drives far more traffic to websites than previous text-based ones such as Delicious. There’s a reason why Facebook paid so much to acquire Instagram. But it is not just new, visual social networks springing up: the old ones are getting more visual too. Facebook’s timeline layout gives more weight to images. [UPDATE: Twitter has recently introduced timeline images too!] Facebook, Twitter and Google+ all have prominent header images on profiles now. This is becoming the norm for what social networks look like. Make sure you use images on any web page or blog post that you want people to ‘pin’ to Pinterest – they can’t share your content if you don’t have a pinnable image!